Tony is an ex coursing Greyhound who's owner contacted us for help. Sadly Tony had started with minor breathing difficulties and his owner was at a loss as to what to do as although he had repeatedly seen the vets they had not found the cause. 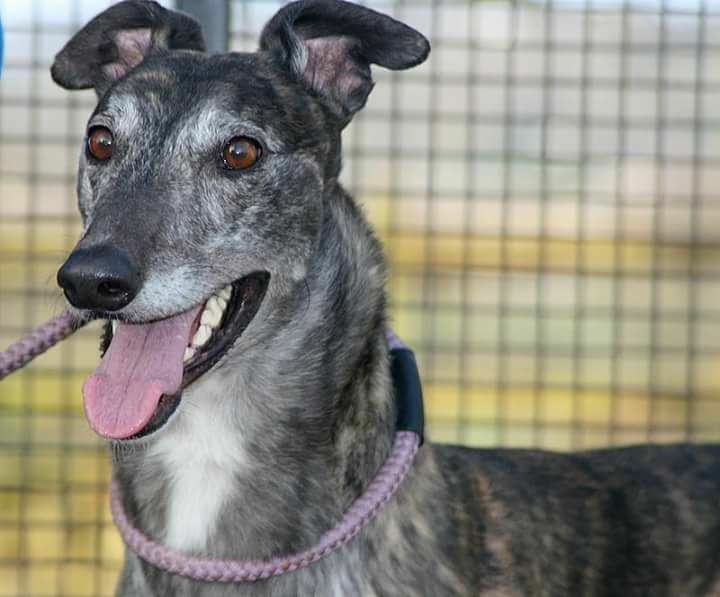 Greyhound Gap travelled to collect Tony and it was evident straight away, having seen it before, that Tony was suffering with a mild laryngeal paralysis. Following an examination and endoscopy by veterinary surgeon, Alan Mayo, at Nantwich it was confirmed that Tony does indeed have LP. Currently its not felt that the condition warrants rectification as the operation itself comes with its own risks. However, this does mean that if he over exerts, or during hotter spells of weather, Tony's breathing levels will increase and become more visibly noisy - its already pretty loud! We felt it was unfair to place Tony up for adoption with this condition as it can be very scary and unnerving for us humans to witness. Of course, if the condition progresses in the future we may have to surgically intervene. One of our fabulous foster homes Helen and family, have once again stepped in to offer a permanent foster placement for Tony. Helen has dealt with one of our dogs before that has suffered from breathing issues so we are confident and happy Tony's condition will not phase her in the slightest! Tony has settled extremely well into his new home where he is described as "such a sweet, gentle boy and the quickest, boldest food thief ever met!!" We are delighted that Helen and her family for taking the big lad under her wing where he can enjoy the rest of his life happy and contented whilst his ongoing needs can be carefully and continuously monitored by our wonderful team of vets. As a sponsor dog Greyhound Gap will remain responsible for Tony's medical care costs for the rest of his life. We cannot thank these extra special families who assist us with our sponsor dogs enough. It's thanks to people like Helen, that they remain safe and secure in a home environment surrounded by love and the best care possible. If you would like to sponsor Tony as a gift for someone there is an opportunity at the checkout to add special notes about your order (such as the name to go on the certificate) and the option to choose an alternative delivery address if required.